Heronetta is a uniquely grand home which sits as one of the very few beachfront properties on the Sandy Lane Beach. Not only is this luxurious home one of the largest properties on the island's much sought after West Coast, but it's also the largest beach property on the prestigious Sandy Lane Beach. The stately home presides over four prime acres of land with 110 yards of beach frontage. The residence provides very spacious living and boasts exceptional finishes. Heronetta is also capable of hosting celebrations of up to 30 guests, so let the festivities begin! Heronetta consists of five double air-conditioned bedrooms, all with en-suite bathroom facilities. Two of the bedrooms are in the main house and the other three bedrooms can be found in the beautifully decorated cottages, which are just around the corner from the main house. The extensively landscaped English style gardens are very lovingly and well maintained. 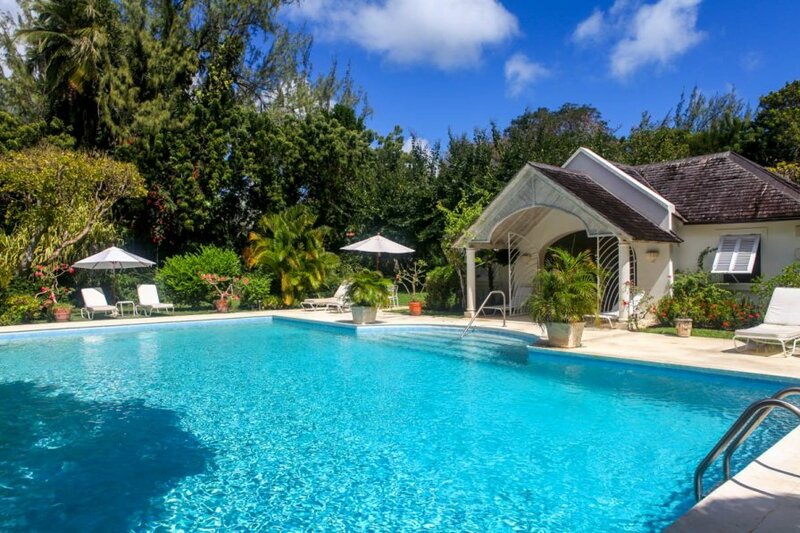 There is a very large swimming pool in the garden and a delightful gazebo dining area. On-site you will also find a tennis court with lights for night tennis, just in case anyone wants to work up a late evening sweat! An added feature of this unique property is its own private Cabana on Sandy Lane Beach, so please feel free to enquire for further details. The villa is within a five-minute drive to the Sandy Lane Golf courses, which also have a host of additional facilities and service. Heronetta is a 5-bedroom villa with fantastic facilities. Not only are guests invited to use the private swimming pool, but a private flood-lit tennis court can also be found on the premises. When visiting Barbados, the first thing you are sure to notice are the gorgeous and renowned flat white sand beaches. On the west coast of Barbados, miles of coral shore beaches and fine white sands stretch along a hypnotising turquoise sea. The West Coast of Barbados is also fringed with countless breath-taking Coral Reefs to provide excellent snorkelling and scuba diving opportunities. The South Coast also offers something for everyone, and is a curious mixture of the Caribbean Sea and the Atlantic Ocean. Here you can swim in calm waters, snorkel over the inshore reefs and tidal pools, and at the southernmost tip of the island, you can windsurf. The East Coast of Barbados has fantastic and lively surfing opportunities, blown briskly by the strong and constant trade winds; the constant breeze of these trade winds give Barbados its mild and pleasant tropical climate. Inland Barbados is delightful to explore, enchantingly quiet and rural there are endless fields of sugar cane dotted with old plantation houses. Barbados has a rich and interesting history and has preserved and restored many of its historic buildings – you can visit a plantation house for a trip back in time, see the towering lighthouses that once led ships to safety, or explore the historic towns that are an important part of the island's past and present.